Boulder residents are likely to have noticed the amount of apartment construction underway in the city. All that development is no fluke; apartments are among the most popular types of investment real estate nationally and in metro Denver. The popularity is due particularly to two trends in demographics: the influx of young people and the aging of the population. Both groups include many people who are apartment renters by choice. 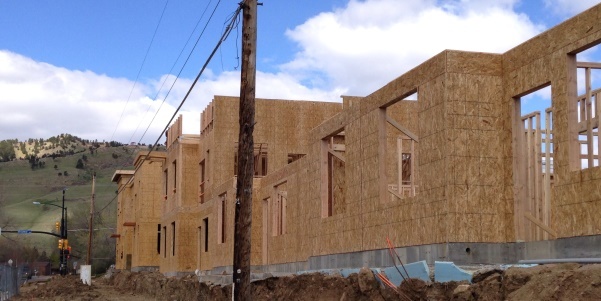 In the seven-county Denver metro area, developers currently have apartment projects under construction containing 17,539 units, of which 2,023 are in Boulder County, and most of those in the City of Boulder. In addition, projects containing 16,908 units have been proposed, of which 558 are in Boulder County. To put that in perspective, metro Denver has 189,776 existing apartment units in buildings of fifty units or more, of which 11,112 are in Boulder County. The apartment market has been appealing to developers, lenders and investors because of low vacancy rates, increasing rental rates, and until recently, a lack of development. That is changing rapidly, and by the end of 2014 the apartment market in metro Denver will begin to become much more favorable to renters. However, it should be noted that most of the new apartment communities under construction are projecting rental rates at the upper end of the spectrum. There is now, and will remain for some time, a dire need for affordable apartments in all parts of metro Denver. Demand for housing is also driven by growth in employment, and metro Denver has been experiencing steady increases in jobs. According to the US Bureau of Labor Statistics, between March of 2013 and 2014 the metro area gained a net 40,200 jobs, of which 5,600 were in Boulder County. The unemployment rate in the metro area in March was 6.2%, down from 6.8% in March of 2013. In Boulder County the unemployment rate was only 5.1%. The first quarter 2014 survey of the apartment market by the Apartment Association of Metro Denver found that the vacancy rate in the metro area was 5.1%, up from 4.6% one year before. The AAMD combines, for statistical purposes, Boulder and Broomfield counties. There the vacancy rate was 6.7%, a considerable increase from the 3.2% recorded one year before. To put that in perspective, a market with a vacancy rate range of 5% to 7% is considered balanced between the interests of owners and renters. For sale housing remains a competitive factor for apartments, especially with relatively low mortgage interest rates. However, as mentioned above, many apartment residents are renting by choice, especially in well-located communities with ample amenities and services. Condominiums were once a competitor for apartments but few developers are building those types of units in Colorado due to uncertainty over construction liability lawsuits. Any condos being built are mainly in high-priced units where construction liability insurance costs can be justified by developers. In some cases, developers have turned to townhouses, where homeowner associations have responsibility only for lawn care and sidewalk snow removal, not building maintenance and structures. Boulder once had few new apartment communities being built. Land costs were high and condominium developers were difficult competitors. That has changed considerably, and as long as Boulder encourages density, especially in transit-oriented and pedestrian-friendly locations, more apartments will be built. As a city that attracts a wide range of renters, demand for apartments will continue, varying only according to availability of suitable sites and temporary market vagaries.